It’s been awhile since I’ve posted new content on the blog. Something about having three jobs, a husband and a toddler makes that difficult to do. As I was making pancakes Sunday morning, I decided this would be a good recipe to share with y’all. Please read instructions all the way through before starting. 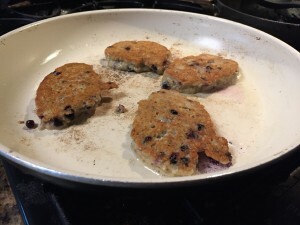 Set out ingredients: Coconut oil, unsweetened applesauce, banana, 2 eggs, vanilla, cashew (or other) milk, spelt (or GF) flour, almond meal, chopped pecans, himalayan pink sea salt (or other sea salt), cinnamon, ground flaxseed, frozen blueberries. Tend to toddler who is politely demanding a pear. Peel the pear, because otherwise toddler chews and spits out all the skin and you find it all over the house. Ask him to please sit on the rug and eat it. Take ~ 2 Tablespoons of coconut oil and melt it in a pan. You don’t have time to measure, so just “ballpark” all of your ingredients. Toddler is requesting the pear be washed because it fell on the ground. Wash toddler’s pear, and ensure him all is right with the world. Add to melted coconut oil: a bunch of applesauce (~1 cup), 2 eggs, a little vanilla (~1 tsp), and some milk (~½ cup). Tend to whining toddler because the dog did something toddler did not approve of. Where were we? Oh, right, we added wet stuff to a big bowl. Go ahead and add the dry stuff to a bowl. Mix it all together. Then add the blueberries, and mix just until combined. Make sure pan is hot, and dump heaping spoonfuls of batter onto pan. Realize you forgot to add the banana to the “Blueberry Banana Nut Pancakes.” Add banana to remaining batter, mashing it with a fork. Keep an eye on the pancakes and your toddler, flipping over when lightly browned. The pancakes, not your toddler. Meanwhile, stop your toddler from dumping a box of plastic straws into the trash. Pull out a tupperware container so that he can practice putting the straws into container. Give him a blanket to sit on because that rug really needs to be washed. Remove pancakes when done and put on a plate. Tend to toddler who is banging on the door to the garage crying “daddy daddy daddy daddy daddy!” Take toddler outside to see that Daddy is busy building a nice wooden garden box. Then calm crying toddler because the sound of the screwdriver is terrifying. Explain how the screw goes into the wood to hold it together and then politely ask toddler to come back inside to eat pancakes. React quickly to catch toddler who has catapulted himself backwards to initiate full-blown tantrum because he wants to do the opposite of what you’re asking. Calmly explain to toddler that he is hungry and that eating breakfast will solve his problem. Carry toddler who is now screaming, crying and kicking you into the house under one arm, keeping your composure. Explain the ingredients in the pancakes and how healthy and delicious they will be. Give toddler applesauce to dip pancakes in because ain’t nobody got time for a toddler with a headache from the sugar in syrup (yes, even if it’s the good organic, Grade B kind, I ain’t ready for that). Sit with your toddler while he eats pancakes because he asked you to “sit sit” and it’s absolutely adorable. Hopefully somewhere in the process you’ve put new batter on the stove and are flipping the new pancakes, because you have to remember to eat too. After toddler is finished eating, clean him up and send him on his merry way. Finish cooking the rest of your batter, while noticing items being thrown downstairs from the top of the stair, over the banister. Ask yourself if he’s really tall enough to be able to do this already? Notice that the items he’s bending and throwing downstairs are the nice family photos you had printed to frame and hang. Have a couple pancakes, pat yourself on the back, and consider pancake breakfast a success. Now it’s time to get dressed and get ready to leave. But first, feed toddler, who is now demanding a pear…no, make that an orange… yes, an orange… right. this. second.